Dried flowers make long-lasting arrangements for the home or office. The Victorians incorporated dried flowers into decorative nosegays to be worn pinned to a blouse or in one's hair. 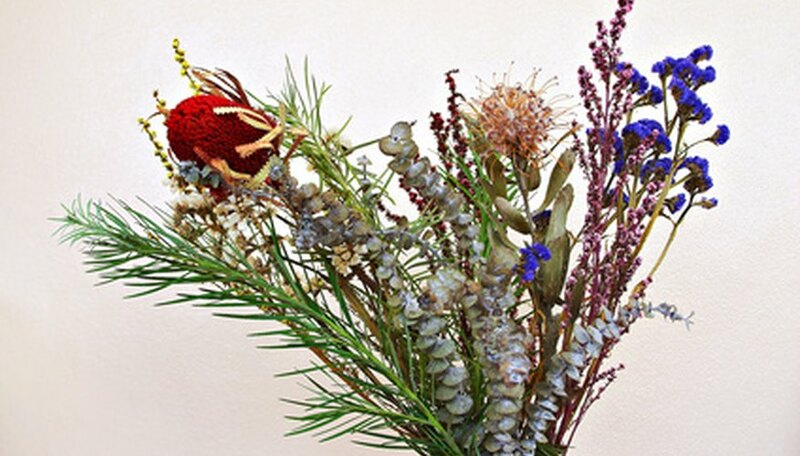 You can decorate cards or packages with dried flowers, or use them to trim a Christmas tree. The best flowers for drying have compact blossoms and deep colors such as pink or blue. White and yellow flowers may turn brown when dried. Roses are the classic dried flower. The best roses for drying are rosebuds and blossoms that haven't opened too wide. To dry roses, strip the leaves from the stems and hang the roses upside down in a cool, dark place such as a closet until the petals are completely dry. The color will darken when dried this way, so that red roses will be a very dark red. You can also cut the blossom heads from the stems and spread them on a piece of paper to dry. The purple blossoms of statice retain their deep color when dried. Statice makes a nice filler for dried arrangements. Dry statice by hanging the stems upside down in a cool, dark place. Statice in fresh flower arrangements will often dry if left in the vase without water. Hydrangea blossoms are prized for larger dried arrangements. Pick hydrangea blossoms when they are fully open and hang to dry. Hang each blossom separately to allow for maximum air circulation. Keep the dried blossoms out of direct sunlight to preserve their color. Celosia, also known as cockscomb, dries very well, retaining its velvety texture and rich colors. Pick blossoms when they're fully opened and hang to dry. White, yellow and red yarrow varieties are attractive in dried arrangements. Cut yarrow blossoms when all the buds on the flower head are open, and hang to dry. Yarrow blossoms are very fragile, so be extra careful when handling them. The seed pods of Chinese Lantern retain their bright orange color when dried and make a nice accent for dried arrangements or to use on wreaths. You can allow the pods to dry on the plant, or pick them and dry hanging upside down or upright in a vase.